"If students hold stereotypes that portray scientists as a different 'kind of person' than themselves, those students might conclude they are not 'science people.' This mismatch between a student's personal sense of identity and a science identity can hamper persistence in STEM." 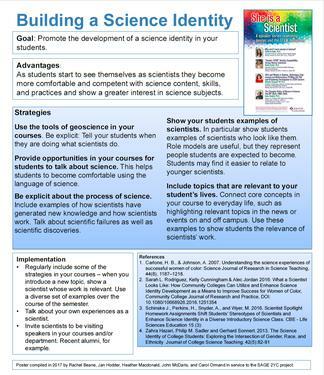 Poster of strategies to strengthen students' Science Identity. Provenance: Poster compiled in 2017 by Rachel Beane, Jan Hodder, Heather Macdonald, John McDaris, and Carol Ormand in service to the SAGE 2YC project. Every individual encompasses multiple identities. When students are considering their future careers and educational pathways, one of the factors involved in their decisions is whether or not they can align their perception of a career with one or more of their personal identities. If they cannot see "someone like them" (whatever that means to them) doing a job, it is less likely that they will follow that particular path (Margolis and Fisher, 1997). Indeed, having a strong science identity is one of the only good predictors of moving into a science-related career field after graduation (Stets et al., 2017). Studies have shown this to be a significant factor in the lack of diversity in STEM fields (Carlone and Johnson, 2007; Hurtado et al., 2009; Zahra et al., 2013). Even though some progress has been made in recent decades, these fields continue to be dominated by white, cis-gendered males which can make it hard for other kinds of students (people of color, women, gender-nonconforming, etc.) to see a place for themselves in STEM. In addition, many students do not come from families or communities where they were exposed to role models from the sciences. Faculty can help students develop a Science Identity by showcasing examples of scientists who do not fit common stereotypes, helping students see scientists as whole people they can relate to, giving students opportunities to practice doing and talking about science, and highlighting content topics that are relevant to students' lives. Dr. Karletta Chief is an assistant professor and extension specialist in the Department of Soil, Water, and Environmental Science at the University of Arizona. 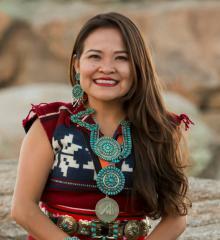 In her extension specialist work, she brings relevant science to Native American communities in a culturally sensitive manner by providing hydrology expertise, transferring knowledge, assessing information needs, and developing applied science projects. Dr. Chief is Diné originally from Black Mesa, AZ. A powerful way to help students see a place for themselves in STEM is to feature scientists who, collectively, present diverse examples of who scientists are and how science is done (Shin et al., 2016). Explicitly show diversity in your teaching. Use a diversity of people in the images included in presentations. Showcase the work of non-white geoscientists when appropriate in your courses. Use both historical and modern day examples of diverse individuals. Beyond visual diversity, also include descriptions of scientists as people. Their interests outside of science and pathways they took to where they are (particularly if part of that pathway included time at 2YC) can show students that people in STEM are much more than one-dimensional characters they are often portrayed as. Schinske et al (2016) discuss the use of Scientist Spotlights as a tool for increasing students' ability to relate to scientists. This activity pairs profiles of diverse examples of scientists with relevant content areas covered in a class distributed throughout the length of the course. For each homework assignment, students read an article about the scientist's research and a resource about the scientist's personal history. Their study concluded that this activity generated shifts in students' stereotypes of scientists and scientist relatability. Students began to be able to see "scientist" as a possible part of their self concept because they were able to understand real scientists as complex people interested in many things. SAGE Musings: Geoscientist Biographical Sketches: How can we help our students - especially those whose parents aren't geoscientists - imagine themselves as future geoscientists? transverse RANGES: transverse RANGES (tR) publishes original, long form interview-format articles about individual geoscientists in all geoscience disciplines. tR is motivated to illuminate themes that connect us, celebrate our diversity, and shape the way we look at ourselves as a collective group of scientists. Time Scavengers' "Meet the Scientists": Stories of geoscientists, what type of data they use, why they enjoy science, and their advice for young future scientists. This special issue of Oceanography illuminates both the progress that has been made over the last decade in addressing career barriers and areas where further attention might still be needed. This is What a Scientist Looks Like is a project developed by freelance science writer Allie Wilkinson to challenge the stereotypical perception of a scientist. Secret Lives of Scientists and Engineers is an Emmy-nominated web series and site from PBS's NOVA. This is where you can learn about cutting-edge science and engineering, the amazing people who do that work, and the things they do when their lab coats come off – win beauty pageants, wrestle professionally, become rock stars and magicians, etc. Black History Month: Making History in the Geosciences is a blog post about four extraordinary Black geoscientists. STEM Role Models Posters is exactly what it sounds like -- a set of downloadable posters about a diverse group of STEM professionals. Conducting the practices of science - authentic opportunities to use the appropriate tools (and not just physical ones), pose and research their own hypotheses, and become comfortable using the language of science - is an important part of developing a science identity (Seymour et al., 2004; Hurtado et al., 2009). Carlone and Johnson (2007) call this Science Identity Performance and it reinforces the concept that students can be scientists because they can do the tasks involved. Explicitly telling them that "this is what a scientist does" can help them see themselves as scientists. There are many ways and levels of engaging students in the act of science. From highly-scaffolded inquiry activities where students can gain proficiency with methods and procedures to open-ended, student-led research projects there are multiple ways to incorporate these experiences into courses and programs. Any activity in a course that mimics what scientists do can be used to "remind" students that they are doing science. Lab activities, field trips, even short in-class activities that involve building skills or habits of mind can reinforce students' identity as a scientist. SAGE 2YC: Engage 2YC Students in Research - Early exposure to research experiences has been shown to be effective in increased recruitment of students, improved retention and persistence in degree programs, motivation for students to learn and increase self-efficacy, improved attitudes and values about science, and overall increased student success. Starting Point: Undergraduate Research - In an undergraduate research experience, students collaborate with faculty on actual research projects, learning about both a particular topic in a field and the research process in general. CUREnet - Course-based Undergraduate Research Experiences (CUREs) can be a valuable way to provide research experiences to large numbers of students who otherwise would not have the opportunity. SAGE 2YC: What do Geoscientists Do? - If there is a job out there with inputs from or effects on Earth or the environment, then there is a geoscientist somewhere filling that role. Understanding the many career opportunities can help students see themselves as practicing for their future. Connect core topical concepts to the students' everyday lives. Real-world examples can show how geoscience is relevant to their families and communities because it can address issues they care about. This kind of work transforms abstract classroom materials into concrete actions that students can relate to. Service Learning is a great example of a way to get students out into the community putting their learning into practice. Incorporating topics that students can relate to, no matter what their major is (where does their electricity come from, how much water does their family use, how was their food produced, etc.) can help students make the connections between what they learn in the classroom with their personal life. The Lifestyle Project is a great way to build students' self-awareness with regard to consumption and sustainability and to move students to action at the personal level. Give students opportunities to dig into something of interest to them. There is usually a geoscience angle to explore that relates to an interest a student has. You can either leave the topic open or provide a set of topics that students can choose from. Point out relevant stories in the news. There is always some way to tie geoscience in to current events and news, whether it is an event like an earthquake or hurricane, a long term risk like climate change, or how to obtain important mineral resources needed for modern technology. Current Events teaching activities from Teach the Earth. InTeGrate: Connect to the World We Live In - Building connections between academic learning and examples, experiences, and issues from beyond the ivory tower can increase students interest in a topic and help them transfer this learning to real life situations in their professional and personal lives. InTeGrate: Connect Justice to Sustainability - Incorporating topics such as risk and resilience in the face of hazards and geoethics provides a unique lens on incorporating environmental justice and the sociological aspects of sustainability into the classroom. Callahan, C.N., LaDue, N.D., Baber, L.D., Sexton, J. van der Hoeven Kraft, K.J., and Zamani-Gallaher, E.M. (2017). Theoretical Perspectives on Increasing Recruitment and Retention of Underrepresented Students in the Geosciences. Journal of Geoscience Education, 65(4), 563–576. Carlone, H. B., & Johnson, A. (2007). Understanding the science experiences of successful women of color. Science Journal of Research in Science Teaching, 44(8), 1187–1218. Flowers III, A.M. and Banda, R. (2016). Cultivating science identity through sources of self-efficacy. Journal for Multicultural Education 10 (3) 405-417. DOI 10.1108/JME-01-2016-001. Hurtado, Cabrera, Lin, Arellano, and Espinosa (2009). Diversifying Science: Underrepresented Student Experiences in Structured Research Programs. Research in Higher Education 50(2), 189-214. Margolis, J., and Fisher, A. (1997). Geek mythology and attracting undergraduate women to computer science. Impacting Change Through Collaboration. Carnegie Mellon University, School of Computer Science, Pittsburgh: Joint National Conference of the Women in Engineering Program Advocates Network and the National Association of Minority Engineering Program Administrators. Pelch, M.A. and McConnell, D.A. (2017). How Does Adding an Emphasis on Socioscientific Issues Influence Student Attitudes About Science, Its Relevance, and Their Interpretations of Sustainability?. Journal of Geoscience Education, 65(2), 203–214. Seymour, Hunter, Laursen, and Deantoni (2004). Establishing the Benefits of Research Experiences for Undergraduates in the Sciences: First Findings from a Three-Year Study. Science Education 88(4), 493.